Have a person on your gift list, but have no idea what to get for them? Making a gift is the perfect idea and it will be even more thoughtful than a silly little gift they don't really want anyway. Infinity scarves are super easy and quick to make. They are called infinity scarves because they look like a continuous piece of fabric in a tubular form. You can make them in almost any type of knit. Knits come in so many different prints that you can make one for every outfit in your closet. - 1/2 yard of knit fabric (sweater knit, rayon knit, ITY knit, cotton knit, etc) Should also be 58/60" wide. 1) Fold the 1/2 yard piece of knit in half the long way. Pin along the entire long edge. 2) Using a thin zig-zag stitch (almost straight stitch), stitch the long edge. 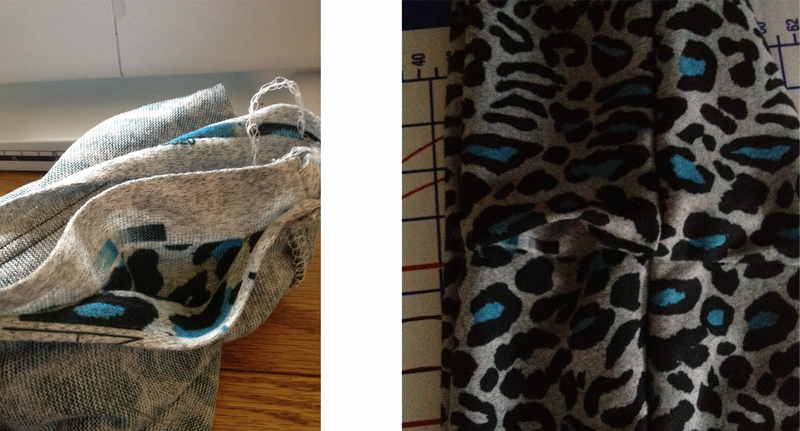 I pull slightly on the front and back of the fabric as it goes through the sewing machine so that when the scarf is finished, it can be stretched and the seam does not break. Serge the seam if possible. You should now have a fabric tube, with right sides together. 3) Put your hand through one open end and grab onto the other open end. Pull the other open end through (still right sides together), matching raw edges (selvedges together) and seams. Pin together. Matching the open ends to create a shorter tube. This is what the scarf should look like before turning it right side out. Left side is the stitched end (selvedge edge)with an opening left for turning. The right side is a folded edge. 5) Turn the entire scarf right side out. Hand stitch the opening closed. Tip: You can make a fuller scarf by cutting more than 1/2 yard. Make a scarf for everyone on your list! What will you be making as gifts for the holidays? Thank you for the idea, now I know what to do with some cute fabric I got in one of your bundles! Thanks for the great sharing! Wholesale Scarves was given to me for new hope this past year and it has gotten some heavy use. Thus an idea began to blossom. This is so cutewholesale scarves or wholesale hats.
! Good for you! I cannot wait to get my hands on a copy of this magazine; especially this pattern! I like the scarf. The directions are good, but you do not tell about connecting the two ends "together" to make a continuous circle. I was confused about that step, also. Great idea! Just could have been explained more clearly on that portion...and with adding "connecting the two ends together to make a continuous circle." I sew, and I agree that step was still missing or confusing or both. I sew, and I just do not get it. How do you sew both ends together?!?!? I am confused as well as how to connect the two together. I just modified the directions again in steps 3/4. You want to bring your selvedges together, right sides together. I hope that helps! Let me know if it does not. I love this tutorial AND that fabric! I plan on making one of these this weekend, hope it looks as great as yours! I am so happy to find instructions for sewing these great scarves...how do sew the ends together to make it a continuous circle? Tuck one end inside of the other end and sew flat. Tuck one end inside of the other end. I turn the edges of the outside circle under so raw edges do not show. Then sew straight across. That will make a circle. Hope this helps. Can you use a machine for that or do you have to hand sew it? You use a machine to stitch this. I just modified the directions a bit because that is where people seem to get confused. Is the 60" fabric? Great directions. Thank you so much. Is the fabric 60"? Thank you for the great instructions. I made one of there in less than 30 minutes ---LOVE it! Running out now to buy more fabric! Thanks for the great idea and instructions! 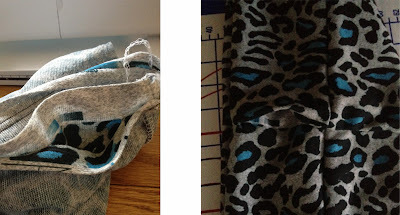 I am excited to try this but I don't have a serger or zig zag my machine is old and was my grandmother's. Over 60 years old but in excellent working condition. Infinity scarf is one of the best gift you can give to your friends or your loved ones, since it is always in on fashion. Infinity scarf can be worn in many ways in different occasion, season and etc. If we know how to knit, we can make one of it for ourself based on what we want. Thanks for sharing this tutorial! I have to say that it was confusing on step 4, but I had faith that it would work out, If it didn't, then your seam ripper is your best friend. Scarf turned out beautifully. I'm going to make these for gifts. EASY PEASY thanks for the tutorial.. Thanks for a great tutorial. I couldn't fathom it out in my mind, but I just followed step by step and it all worked!